I am a real sucker for a disaster movie. The Towering Inferno is in my list of favourite movies. I cannot get enough of the one-dimensional characters, the corny dialogue, the contrived plots and, of course, the disaster itself. So imagine the levels of excitement that built when I first heard of San Andreas, an earthquake movie. However, even though all the elements are met, this one somehow doesn’t quite hit the mark of past films in this genre. The problem is too much disaster. Ray is a rescue-chopper pilot with family issues. His wife, Emma, is on the verge of divorcing him, meaning he will lose his daughter, Blake, to top flight architect, Daniel. Then Nevada is hit by a massive earthquake and it’s heading down the San Andreas fault towards San Francisco. Ray’s wife is stuck in the city, while his daughter is in Frisco. Ray must try to save his family before a second, more powerful earthquake hits. The thing that made the early Irwin Allen disaster movies work was that even though the starry casts were secondary to the sinking ships or the flaming buildings, he, at least took his time setting up the situation, building the tension and even allowing his stars to try to create some form of characterisation, so we knew who was the good guys, the villains, the nervous ones etc. Director Brad Peyton and script writer Carlton Cuse (name of the year) remove such formalities and so a quick introduction the key players and then we are off, with a non-stop, effects-heavy earthquake that goes from being loud, to louder to louder still. The effects are pretty spectacular, with building toppling, explosions galore, people being swallowed in holes and, of course, a massive tsunami. The modest budget of $100 million is all up there on the screen. Yet that is the heart of the film’s problem. It’s relentless in its level of destruction, refusing to allow any real character development, so when a tragic incident does occur, we feel very little emotion for them. It’s also riddled with the cheesiest, clichéd dialogue around. Even that other disaster fan, Roland Emmerich, has to dop his cap to Cuse’s dire script, which has characters saying things like “I’m going to save my family!” and “This is not a normal day!” After a while, you find yourself giggling at how ridiculous things get, as Ray’s very efficient daughter manages to steal from a fire truck, right in front of the police! Or just how Ray and wife, Emma, manage to drive a boat over an oncoming tsunami, while avoiding an enormous cargo ship! As far as the performances are concerned, the cast aren’t allowed to stretch any further than shouting and screaming over the top of the deafening sound effects. Kylie Minogue makes a very brief appearance, while the excellent Paul Giamatti is stretched to looking concerned as an Earthquake expert. 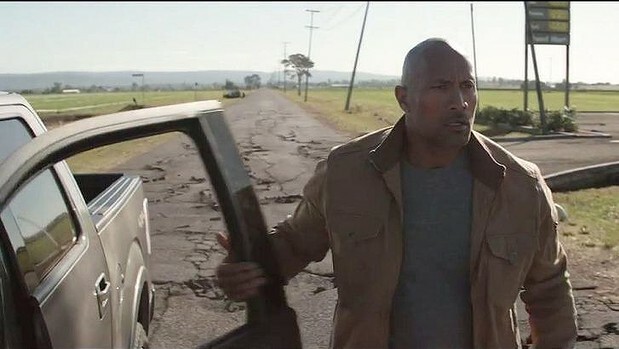 Even star lead Dwayne Johnson, with his bulging muscles and huge screen charisma, has to play second fiddle to the mass destruction on-screen, although no matter how heroic he is, shouldn’t he be trying to save as many people as possible and not just his own family? San Andreas wants to be as big as those now classic 70’s disaster movies and even Johnson has been heard in interviews comparing it to the 74 gem, Earthquake. It may be big on the set pieces, but it lacks the heart of that film. If you like your films loud and full of chaos, panic and wanton destruction, then you are in for a treat. If you want to see an unintentionally funny film that is as ridiculous as it sounds, you are in for an even bigger treat.